The services offered by the Watertown Public Library are just fine — for 1930. So says Director Mary Carol Powers, adding that the services a library can and should provide have increased and changed in the last 52 years. She said libraries in communities large and small are expected to be centers of learning and culture and depositories of information and knowledge as well as book lending agencies. They are expected to be centers of activity beneficial to the educational and business communities, and to the community as a whole. The Watertown library could be doing a better job of keeping up with today’s expectations, Powers admits. She blames lack of space and adequate facilities. Fire Chief Richard Olson will retire March 31 after serving in Watertown for 5 1/2 years. Olson gave formal notice of his retirement plans to the Watertown Police and Fire Commission this week. Olson said, “I am age 53 and I'm qualified to retire and it has been my intention to do so at this time. I have other things I want to do and I have some job opportunities that I will consider seriously.” Olson said he recommends that the city appoint fire Capt. Henry Butts as interim fire chief while the department searches for Olson's replacement. Olson succeeded Ron Weavel as chief. Weavel held the post from 1987  to 1994. ROCKTON, Ill. — Rockton fire Chief Ron Weavel Sr., who has served nearly five decades in fire protection, retired January 12, 2009, from the Ronkton, IL fire department. Weavel, 68, was the fire chief of the Watertown Fire Department from December of 1985 to January of 1994. Weavel’s career began in 1958 when he enlisted in the U.S. Navy and was offered the opportunity to work at the Great Lakes Naval Station’s Fire Department in North Chicago. When Weavel’s military career ended honorably in July 1962, he continued to work at the naval fire station as a civilian worker and was later employed with the Beloit Fire Department in Wisconsin for a short period of time. He started working with the Rockford Fire Department as a lieutenant in October of 1966. He then moved to Watertown, Wis., with his family in 1985 to take his first position as chief. In 1994, he became chief of the Rockton Fire Protection District. Weavel said one of the factors that resulted in him leaving Watertown for Rockton was the controversy surrounding a delayed response to an activated fire alarm at Marquardt Manor . Weavel added if it was not for this incident he probably would have stayed in Watertown until he decided to retire. A Watertown man, veteran of the Milwaukee Road, made his last run into the city Saturday evening as conductor of a passenger train which reached here at 6:40 o’clock. He is Fred W. Fenner, 72, of 1117 South Eighth Street. Mr. Fenner retired with the completion of the Saturday evening run from Milwaukee to Watertown. He lacked by two days a record of 50 years of service. He would have liked to make it an even half century but was forced to give up under a new union rule which required the Milwaukee Road’s employes to retire on pension at the age of 70. The new rule affects hundreds of workers, the Milwaukee Road officials said. The new compulsory education law passed by the last legislature about doubles the clerical work in the office of the county superintendent of schools. It requires the district clerk to take a census of the children of school age in his district and to furnish reports of such data to the town clerk, the teacher in the district and the county superintendent. Teachers are required to report the attendance at their schools to the county superintendent, and he in turn checks up with the census to ascertain if there are children who ought to be attending school but do not. All children from 7 to 14 years of age must attend school for 24 weeks a year and those between the ages of 14 and 16 must either work or attend school. Parents violating any provisions of the act are liable to a fine of not less than $5 or more than $50 or three months in the county jail, or both at the discretion of the court. Incorrigible children are to be dealt with by the sheriff and district attorney. The aim of the new law is to raise the standard of the country school, reorganize it along the lines of the city schools which already have laws which make it obligatory for children to attend school. The plant of the Watertown Daily Times yesterday afternoon virtually was engulfed by the followers of U.S. Senator Hubert Humphrey, newspapermen, columnists and representatives of national publications. They poured out of a special Humphrey chartered bus parked across the street from the Times' building. Led by the senator, they streamed into the Times' building in what appeared to be endless numbers, clogging the stairway and the second floor hallway until the group could be distributed into the various rooms on the second floor of the building. In all, there were more than 30 persons. They included Marcus Childs, well known Washington columnist whose columns appear on the editorial page of the Daily Times. The group also included representatives of Newsweek, and the Christian Science Monitor, United Press International and a number of political writers for midwestern and eastern papers. A preliminary report from the Watertown Veterans Council proposing a miniature honor roll to be placed on the north wall of the first floor lobby in the City Hall was turned over to the City Council last night by City manager Dean Van Ness. The veterans group some time ago asked that the present honor roll in the Armory building be relocated and at the time suggested the Cole Memorial Hall of the Watertown Free Public Library as a possible site. It was also at one time suggested that instead of a wall roll the names be inscribed in a special leather-bound volume and kept in a glass case in the library. This plan was later rejected. The latest plan of the veterans council is that the miniature roll honor roll be prepared and that the present honor roll in the Armory be kept intact but that no new names be added to it there until such a time as it can be suitably relocated. The end of the Cold War has led to a changing role for local Army National Guard units, including the Watertown unit, based at 1700 River Drive. Capt. Vernon Langholff, commander of the newly combined Watertown and Oconomowoc unit, said his troops learned their new mission during a two-week training session at Fort McCoy completed on June 27. "During the Cold War, in case of a war in Germany, our mission was to destroy tanks," Langholff said. "With the end of the Cold War, our mission went away." Along with the mission, the Watertown armory's 24 TOW-missile launchers have left and have been replaced with armored personnel carriers. Troops in the local National Guard unit now will serve as foot soldiers. This week the work of repairing the Court House at Jefferson was to have been commenced. An addition of twenty two feet is to be made and the building brushed up generally, making it as comfortable as the appropriation allowed for the purpose will permit . . . That ought to make it answer its purpose very well for four or five years yet, by which time Watertown will be able to erect a new building and present [it to] the county, in consideration of her being made the county seat. There was a time, many will remember, when Jefferson came dangerously near losing the county seat. It was in 1856, we are told, when the discussion as to the location of the county seat which had been in progress for a considerable time, was finally brought to a decision. Watertown as well as Jefferson was in the race for the honor and finally, as a way out of the difficulty, for the war had waxed rather bitter, a bill was introduced in the legislature by William Chappell, which provided for a vote of the people to settle the dispute. The bill also provided an exemption for "repeaters" from the penalty usually attached to such misdoings, and to this day it is believed, that this more than any other feature, saved the day for Jefferson and left Watertown in the lurch. One polling place, known to every voter round this section, was designated "Krumnanauer's Poll," its location being at a point on the Milwaukee road some two miles and a half east of Jefferson. With a polling list containing the name of every known voter, and school boy, besides a reasonably long list selected from an old Cincinnati directory, a delegation swooped down upon the county officers presenting those so-called supplemental returns, and thus won the day. It was but a repetition of former events, for in this instance also, it was the "Prussians" who saved the day. Watertown High's first journey to the state tournament in 21 years ended in total disillusionment on the fieldhouse court at Madison Friday afternoon when the Goslings lost to Racine Park, 60 to 55. The defeat dropped the Blues from further contention in the tourney's consolation bracket. The Goslings, badly outplayed by Menomonie in their first tourney game, came back well yesterday against Park but they couldn't quite muster the punch to pull them over the hump. John and Tammie Jaeger, 819 Richards Ave. The home, purchased by the Jaegers in 1988, was carefully renovated by them with sensitivity towards late-Victorian Queen Anne vernacular style. In maintaining this style, appropriate exterior materials were used such as shingles on the roof and gables, clapboards on the lower two stories and design restoration features of the porches. Watertown voters showed strong support for renovation and expansion of the Watertown Public Library in Tuesday’s general election. The library referendum question was passed by a margin of nearly 2-1, more than even the most optimistic supporters of the plan had anticipated. The final tally was 3,432 in favor and 1,843 opposed to the question. The question on the ballot stated, “I favor expansion and renovation of the Watertown Public Library, cost to the city not to exceed $1,250,000.” Voters in all 13 aldermanic districts supported the plan by a wide margin, with some districts approaching a 3-1 edge. E. W. Kellerman and John Uherr of this city, have purchased the patent right on a new clothes reel, which they propose to manufacture and put on the market. The new device is a very simple but practical one. It does away with the unsightly platform made necessary in order to pin the clothes on the line. The reel can be lowered, while the clothes are being fastened to the lines, after which, by means of a lever device, the reel can be raised about as high from the ground as they are with the old style reel. The lever works easily and a child can manipulate it. The only obstruction is a post in the ground, therefore it does not spoil the look of a lawn or yard. One of these new reels is now on exhibition at Mr. Kellermann’s home on Third Street. A representative of The Leader inspected the same yesterday and is confident that the gentlemen have a new device for the convenience of housewives that will yield the manufacturers good money and meet with ready sales. The attention of the public, especially the owners of fast horses, is called to the fact that the track at the fairgrounds is now in excellent condition for speeding. Local horsemen are invited to use the track at any time. Considerable work has already been done on the track and it is hoped the local horsemen will take advantage of this opportunity to speed their horses and get them in trim for coming race events, the first of which will be a matinee, the first of a series of which is expected to be held in June. Yesterday there was a little “brush” at the track between three local horses and it is expected that they will become more frequent as the weather moderates. There will not be a solicitation for funds to carry on the 1954 post-prom party, it is announced following a meeting of the Elks committee which is handling the arrangements for the annual event. "Enough money has been accumulated from donations from business firms, professional men and manufacturers over the past two years to finance the 1954 party," John D. Clifford, committee, chairman, reported today. In announcing that a solicitation will not be made this year, the committee today expressed deep gratitude for the splendid cooperation and fine financial support that has been received." These annual parties are community affairs," Clifford said. "The support comes from a large number of firms and individuals. Without their help, there wouldn't be any parties." Friday night, the gymnasium of the Watertown High School will be transformed into a ballroom of heavenly fantasy for the 1957 junior prom of the high school. “Meet Me Tonight in Dreamland” has been selected as the theme for this year’s gala affair. Prom King Carl Krueger, son of Mr. and Mrs. Carl Krueger, route 2, and Prom Queen Linda Dierker, daughter of Attorney and Mrs. Roland Dierker, 1010 South Eighth Street, will lead the grand march at 9:30 o’clock. Members of the court of honor are: Bernie Pierce and Sharon Nelson; Senior Class President Don Draheim and Bobbie Krebs; Norm Melcher and Jo Orhmundt; Jim Schumacher and Marjorie Negus; Bob Wallace and Junior Class Secretary Liz Derleth; Class Treasurer Mike Sproat and Class Secretary Nancy Buelow; Class Vice-President Lowell Pritchard and Mary Ann Nimm; Class President Don Krueger and Mary Mullen. A proposal to fill the area underneath the fire department floor to increase the load carrying capacity of the building was defeated by the Watertown Common Council Tuesday. The council voted 5-3 against hiring West Bend/American Building Systems for $76,231 to fill the portion of the basement underneath the department’s floor. The fire department has not been storing its heaviest vehicles in the fire station since last year, when it was determined that the floor was not designed to hold vehicles weighing more than 30,000 pounds. In addition, deterioration of the floor has led officials to believe that the actual load capacity has been reduced further. After 43 years in business, Birkholz Floral Shop today became Draeger’s Floral and Gifts. The sale of the shop to new owners Palmer and Judith Draeger of Helenville was finalized Wednesday, and Draeger’s Floral and Gifts opened today at 616 East Main Street in Watertown. The Draegers will continue the services offered by Christian and Edna Birkholz, supplying fresh cut flowers, plants and green plants as well as floral arrangements for funerals, weddings, birthdays, anniversaries and other occasions. The shop also features a large selection of silk flowers and gift items and offers FTD and Florafax service for out-of-town orders. A 30-year-old school in the city will open its doors Wednesday to show off a $250,000 dollar facelift. The school, built in 1967, has been polished and the parking lots blacktopped for the start of school. Most of the money spent on the school this summer, however, is tucked away inside the walls and ceilings of the school. The district spent $237,828 on the project, in addition to $15,600 for a site survey completed prior to the bidding process. The investment is now wrapped up in a wiring system designed to meet all the needs of the entering sixth-graders in 1997 and continue meeting needs of children for years to come even after the entering class advances to high school in the year 2000. Home building is taking a sudden spurt in Watertown after a letdown. This month will see the greatest number of new homes begun of any month since November, 1955. The total thus far in August is 17 new homes approved by the office of the city building inspector, City Engineer Floyd Usher, with several more days to go. In November, 1955 a total of 24 new homes was approved by his office. In July only six new homes were approved and in June ten were given approval. May was the greatest previous home building month here this year, with a total of 12 approved. The “M” Stove Manufacturing Co. has commenced work preparatory for the coming winter and the work shops here put in order yesterday. The company, which has been in existence but a short time, has done a very successful business with the new patented stove the “Meteor Triad Heater.” This year they are putting another heater on the market, greatly improved over last year’s stove and the sale is expected to be good. H. R. Moldenhauer, secretary and treasurer of the company, is looking after affairs in the city. The first annual Watertown Athletic Booster Club golf outing Monday turned out to be a monumental success, according to organizer Tom Lees. “Starting with the weather, everything was just perfect. The response from the people who supported us was just great. It was really gratifying.” Some 125 people participated in a best position tournament in the afternoon and were joined by another score of people for dinner. A permit was issued for a new vehicle service center at 1718 S. Church St., according to the city’s business inspection office. A Tires Plus store is planned just north of the Sears store on the west side of South Church Street. The Tires Plus will offer various automotive services, including tire repair and replacement, oil changes, brake repairs and wheel alignments. Another development is planned to the north of the Tires Plus store. A strip mall located between the tire store and the Watertown Fuel Center is in the planning stage. An electric eye will operate the light beacon atop the city's new west side water storage tank. Work on the electrical installation will be underway this week. The beacon will be mounted at the very top of the huge globular tank, which towers 180 feet into the air. Also to be installed on the tank will be an automatic gauge which will register the amount of water in the tank. It has a 300,000 gallon capacity. The tank is nearly completed and painters are at work on the structure. The name "Watertown" is to be included on the side of the globe. Watertown fire losses in 1957 were up over figures in 1955 and 1956, but they were still low for a city this size, the annual report of Fire Chief Al Linde today showed. The year 1957 did not see a single major disastrous fire in the city. Fire losses for the year were estimated at $24,700. In 1956 the loss here was $9,744.17 and in 1955 it was $14,772.42. A total of 184 alarms was responded to in the city this year. In 1956 there were 161 alarms. Rural losses in the area which the department serves were higher than in the city this year. Estimated damage was $34,515 and 55 alarms were answered in the rural sections. In 1956 rural losses were $8,225 and there were 36 alarms. In 1955 rural losses were $20,565. The Fire Department was called out yesterday afternoon shortly after 1 o’clock by an alarm of fire turned from box 16, First ward. The fire proved to be in the warehouse of Lehmann & Schroeder, 400-417 First Street, the same having been occasioned by the spontaneous combustion of a barrel of roofing paint. Before the arrival of the fire department the barrel of paint had been removed from the warehouse, out into the street where it was burning when the department arrived and its services were not required. In the work of removing the burning paint from the ware house and preventing the spread of the flames, Fred Lehmann had his hands and face quite severely burned and went to his home and physician was called to dress his burns and alleviate his sufferings. His many friends in the city hope that his injuries are not serious and that he will be able to attend to business in a few days. The usual Trinity ordinations occurred at Nashotah on the 3rd. The occasion was one of deep interest and importance. A number of distinguished visitors arrived during the previous week. A deputation of the church friends from Janesville encamped in a fine tent, with all the necessaries for a comfortable and pleasant stay. Early in the day delegations from Watertown, Waukesha, Oconomowoc and other adjacent places came in one after the other and long before the exercises began the grounds were covered with visitors from the surrounding country . . . A liberal collection amounting to between four and five hundred dollars was taken up, to be appropriated to the finishing of the new chapel. Altogether the day was one of marked and unusual interest to the friends of the Episcopal Church. The college at Nashotah, even in this day of its infancy, is doing a noble work and, when its high aims shall be fully realized, there will be no measuring the good it may accomplish through the ages of the future. The Watertown City Council approved the transfer of trauma patients to Madison and Milwaukee hospitals by Watertown EMS vehicles. A provision allowing transportation of patients who have already been admitted to the hospital was reinstated to the resolution. The provision was stricken at the last meeting because aldermen feared it would allow the transfer of non-critical patients. Dr. Terry Turke, chief of staff of Watertown Memorial Hospital, assured them that physicians would treat the service as an adjunct to current services provided by the Lebanon, Ixonia and Johnson Creek EMS, for emergency patients for whom the time saved in using a local vehicle could be “a life saving factor.” He said only one or two inpatients a year may have to be transferred. Only one vehicle will be allowed to go on intercity transport at any one time, but Alderman Lawrence Seeber still said that was one too many. The directors of the Merchants National Bank of Watertown announced that they have purchased suitable premises to enlarge their banking facilities to better serve their customers. Today's pattern of steadily rising costs and overcrowded lobbies make it imperative that a drive-in window will expedite transactions and encourage maximum use of the window during banking hours. A building engineer has been retained to draft and prepare plans to improve these premises for drive-in banking services and additional space for other banking needs. Although the water supplies of many communities in the state may cause health problems, the well water supply in Watertown meets all of the health standards and presents no potential hazards to the city's population, according to a specialist of the Department of Natural Resources. “The water meets all of the health standards. Everything is fine,” said David Hansen, environmental engineer of the Bureau of Water Supply, southern district. A $58,000 plan to use paid, on-call firefighters for some staffing needs was endorsed by the finance committee of the Watertown City Council Monday evening. A plan by Fire Chief Richard Olson, costing an estimated $58,000 a year, would provide better staffing at the department. The committee also directed the fire department's leadership to take steps to reinstate the city's inter-facility transport program, a source of revenue for the city and an additional service for residents. The department in the past several years has had trouble staffing ambulances for transportation of patients to hospitals in other cities. To show how the transport service has diminished, the fire chief presented statistics from the department's billing agent and said that on 57 occasions in 1999 the department received either no response or not enough of a response to staff an ambulance to accomplish inter-facility requests. School boys and girls, you had better look a little out or the truant officer will catch you if you don’t. To comply with chapter 446 of the laws of 1907, providing for the appointment of a truant officer in all cities in the state of 2,000 or over, the board of education at a regular meeting last evening appointed Chief of Police H. C. Block as such officer the salary being fixed at $10 per month, or 10 school months. The duties are to commence upon his acceptance. According to the law as amended at the recent session of the legislature, all children between the ages of seven and fourteen years and between the ages of fourteen and sixteen years, if not regularly employed . . . must be in regular attendance at some school . . . during the school year . . . All cities of over 2,000 inhabitants must appoint a truant officer . . . Architect F. L. Lindsay is drawing the plans for the proposed new city building for the storage of all city property including the No. 1 fire engine. According to the plans as being drawn, the building will be 54x50 feet. In the main building on the ground floor it is the intention to keep the fire engine, the steam roller, the street scraper and the sprinklers. The second story would be devoted to the emergency hospital, janitor’s room, and hay and feed storage. The shed will be used for the storage of the street sweeper, wagons and general storage purposes. The plans call for a building of solid brick, with prepared brick with stone trimmings for the front. JEFFERSON - The Watertown Gymnastic Association also known as the Watertown Turn-Verein has filed a suit against the city of Watertown in Jefferson County Circuit Court. The association in its suit is claiming that the city has wrongfully placed its property on the tax rolls and has levied and assessed taxes against the organization in violation of the exemption statute. The association is requesting that it not be subject to taxation and that it have a judgment accordingly, together with costs and disbursements of the action. The Junction House, at the point where the Chicago and Northwestern Railroad crosses the Minnesota and Milwaukee line, is kept by H. B. Sherman, who has surrounded himself with all the facilities for entertaining travelers in the best style. His tables are always abundantly supplied with the choicest delicacies of the season and everything about his large establishment has an appearance of neatness and care that at once wins the confidence of all. A good meal can always be had at that place. H. H. Courville, proprietor of the Junction Café, has just completed remodeling and redecorating the interior of his place of business, and it now presents a very inviting and homelike appearance. Conspicuous over the bar hangs a sign, “Nothing Sold to Hobos Here,” [and] to the right of the door is another sign printed in large letters “Nothing Sold to Minors Here,” both of which Mr. Courville rigidly enforces, and the result is boys under 21 years of age as well as tramps give that section of the city a wide berth when they are in search of intoxicating beverages. If all saloon keepers in Watertown would rigidly enforce these sentiments Watertown would not be visited by so many tramps and the saloon business here would become more tolerant. Lightning often plays some curious tricks with the telegraph wires. Last Thursday, about two miles north, the lightning struck and shattered three telegraph poles, melted and fused over a hundred feet of wire, followed it down to the station house in this city, and set on flames the curtain of the window, consumed a map hanging nearby, and scorched the fragments of paper lying around. Luckily the fire was discovered and put out before further damage was done. The Planters Hotel, we are glad to know, under the management of its present popular and attentive landlord, Mr. N. Pratt, still flourishes and enjoys its share of popular favor and patronage. All who stop there find ample accommodations and go away satisfied, and when guests are so well pleased, all must be done just about as it should be. At least we think it a good rule to guess by, and be right every time. A proposal to build a preschool and day-care center on West Main Street to serve more than 70 children was submitted to the Watertown Site Plan Review Committee. Maranatha Baptist Bible College and Academy proposes the 5,000-square-foot center to be located across the street at 828 W. Main St. A Maranatha-owned house at that location would be razed. The committee recommended the proposal go before the plan commission, which must approve a conditional use permit for the project before construction can begin. The full-service preschool, providing morning and afternoon classes, and day-care center will cost about $500,00 to $550,000, said Dr. John Brock, vice president of the college's academic affairs and member of its preschool governing board. It would include six classrooms that could be opened for a larger play area, a reception area, administrative office, sick room, kitchen and storage room. A play yard outside the building is planned. A penny, minted in 1860, which R. J. Hoge lost 59 years ago when he was a small boy and the family lived in a house at 203 North Fourth Street, was recovered by him the other day when he visited the place, scene of wrecking operations in connection with demolishing of St. Luke's Lutheran Church for a parking lot. Mr. Hoge, of the Bank of Watertown staff, recalled that he lost the penny when it rolled along the floor and disappeared between two boards. He tried at the time to recover it with a wire but was unsuccessful. Over the years, he said, he frequently recalled that penny, especially when he passed the old house where he used to live. The other day he went into the house, after obtaining the key from the wreckers, and after digging around in the debris he was amazed to find the penny. He said he knew exactly where it had disappeared and it was still in that area. Watertown has experienced the coldest weather in its history during the past week. The cold snap set in Saturday night and has continued ever since. Saturday night the thermometer registered 20 degrees below zero, Sunday night 35 below zero, and Monday night 25 below zero, Tuesday night 20 below, and Wednesday night 10 below. The heaviest rainfall in Watertown’s history covered much of the city with up to four feet of water Saturday, causing extensive damage to businesses and residences and turning streets into canals. The city received 6.65 inches of rain between 7 a.m. Saturday and 7 a.m. Sunday, most of it Saturday afternoon and early evening. This nearly doubles the old record, said Richard Hoge, who has observed Watertown weather for more than 50 years . Over the weekend, Hoge researched city weather records going back before the turn of the century and turned up the old record of 3.54 inches on June 30, 1938. The official report of 6.65 inches was taken by employees of the Wastewater Treatment Plant. A similar reading of 6.03 inches was recorded by Hoge on an official rain gauge located in the Riverside Park area. It's a new National Guard with new opportunities and benefits, a group of Watertown business leaders were told at a breakfast meeting with state and local officials of the Wisconsin Army National Guard Thursday at Balistreri's Restaurant. Brigadier General James J. Lison Jr., deputy adjutant general of the state guard, told the Watertown businessmen, "The national guard unit in Watertown needs your cooperation and help to bring it up to a strength capable of handling jobs that may be required of it." He pointed out that the Watertown unit, a longtime member of the local community, had been at its authorized strength throughout the Vietnam War but started to decline after the war ended and the draft was halted. Renee Maas will head the new Watertown branch of the State Bank of Reeseville. The branch will be located on Highway 19 in a new building which is expected to be open by August. She was named manager at the annual directors meeting of the bank. "She was named head of the Clyman branch of the bank, and will become manager of the Watertown branch when it is built," said Gerald Yerges, president of the State Bank of Reeseville. The Clyman branch of the State Bank of Reeseville will be closed when the Watertown branch opens. Maas is a graduate of Watertown High School and has 18 years of experience in banking. She is a graduate of Wisconsin Bankers Association Basic Banking School. She was formerly employed by Lebanon State Bank. The sophomores will give a class party next Saturday evening. Appropriate exercises will be held next Friday at the High school in honor of Lincoln's birthday. Tuesday evening the juniors defeated the seniors in a debate, the score being 4 to 1. The subject was: "Resolved that senators I should be elected by popular vote,” the juniors upholding the affirmative. The competing debaters were Seniors, Ernst Owen, Edgar Melzer, William Richards, juniors Gilbert Green, Jacob Sproesser, Edward Witte. On Thursday evening at the High School Mr. Seymour will give his third lecture of the course. His subject is Pericles, the Athenian statesman and patron of art. Pedicles was the leading man of Athens when that city was at its height of power and I glory, when it was the center of the world's civilization. Those who have heard Mr. Seymour on previous occasions look I forward to this lecture as a rare treat. Reorganization of the Watertown Ground Observer Corps, handling the skywatch program under Civil Defense, will be launched here next Tuesday night at a meeting to be held at the City Hall, third floor, starting at 8 o'clock, according to announcement made by Arthur H. Krueger, who is to direct it, although his formal appointment by the city manager still lacks confirmation. Before the program here was abandoned some weeks ago, due to lack of cooperation from state Civil Defense authorities, Watertown had what was regarded as the best skywatch program setup in the state and it was being used as a model in the state. A regional accrediting agency will recommend that Northwestern College's accreditation continue for 10 years. A team of educators from the North Central Association of Colleges and Schools decided to make the recommendation after reviewing Northwestern's programs. The continuation, which would last through the school year 2003-4, is the longest allowable period between comprehensive reviews. The visit was the culmination of a long self-study by Northwestern. Over the past year, the college has reviewed its organization, faculty, curriculum, instruction, library and student services. Professor James Korthals organized the study and prepared the 195-page report, which was the basis of the visit. Thursday afternoon of last week Miss Celia Kwapil, who was in the terrible theater fire in Chicago a few weeks ago, visited The Gazette office and told of her experience in that terrible holocaust . . . She is still suffering somewhat from the effect of the fire. Her hair was singed, and her ears badly burned and are still kept covered with bandages. Kwapil is only 14 years of age . . . The afternoon of the fire she attended the performance of "Mr. Bluebeard" at the Iroquois theatre in company with Mrs. Ignace Pilat and her two daughters, Josephine and Helen age 10 and 13 years. They were seated in the second balcony, six rows from the front, she says, and during the moonlight scene on the stage in-the second act she noticed a small blaze to the left of the stage . . . She was immediately seized with a terrible feeling of fear and remembers Mrs. Pilat remarking: "When they lower the asbestos curtain it will save us all." She saw a man (Eddie Foy) step to the front of the stage and tell the people to keep still, and just as he got through a sheet of flame darted over their heads in the gallery, and a great rush was made for the exits . . . Just then a door was opened by an usher. It led to a fire stairway and those about here rushed for the door. The passage was suddenly obstructed, however, from some unknown cause and the crown went back up stairs, and the people below in the alley shouted all the time to them to jump, and many of them did so . . .
Miss Kwapil escaped by jumping from one landing to the other — she crawled between the railing irons on the third platform, and swinging under dropped to the second landing, and from the second to the first in the same manner, and then jumped to the alley below . . . She was picked up by a man, who held her until she regained her strength, and then she went into the street and entered a restaurant. This being crowded, she left and she was taken to a dental parlor, and a telephone message was sent to her sister . . . She was finally conveyed to her sister's and cared for. She remained in bed a number of days, and by careful nursing she fast regained her strength and got over her nervous shock . . . It was a most horrid and terrifying sight, she says, and it will be many a day before she will be fully recovered from its effects on her mind. The Watertown Library Board will seek estimates on the cost of major repair projects to be undertaken if a referendum to expand the library fails in November. The best solution to the library’s needs is expansion, said Head Librarian Mary Carol Powers, but the board wants to be prepared in case expansion is not approved. Some major — and potentially costly — areas in need of maintenance, including roofing, air conditioning and heating, have been identified. A new bell is soon to be placed in the belfry of the Watertown Moravian Church, the same having been a donation from the late Henry Hobmann. The new bell will be placed sometime in September. Schnappsie, the Fire Department’s dachshund mascot, has a birthday today. He is one year old, according to Earl Mundt, the original owner of Schnappsie and his six “brothers” who were born as a litter. Schnappsie dined well today on his birthday — but it was no different than any other day. He dines well every day. And he looks it. Aside from his rotund figure, he is hale and hearty. During the past year Schnappsie’s picture has appeared in papers from coast to coast. The United Press sent out a picture to all of its client newspapers. The Christian Science Monitor, published in Boston, also published a picture of him. The owner of the Watertown Upper Dam has been ordered to cease operations of its hydroelectric generating project at noon today. According to the Federal Energy Regulatory Commission, operations by Rough and Ready Hydro are responsible for the departure of a species of fish in the Rock River near the upper dam and for vibrations that cause damage to residences in the area. The commission issued a compliance order on July 3 to Rough and Ready Hydro to cease its project operation on the Rock River. According to the commission’s order, Rough and Ready Hydro Company is in violation of its run-of-river requirement, which is a condition of its operating license for the generating plant. Yoni, a Japanese employed as a wiper in the Southern Pacific shops in this city, narrowly escaped serious injury at the hands of an enraged mob of American workmen yesterday. Yoni was wiping an engine on which had been placed two small American flags. While wiping the engine, Yoni turned and deliberately spat upon one of the flags. His action was seen by another workman who immediately pulled Yoni from the engine to the ground at the same time acquainting the other workmen in the building of Yoni’s act. A crowd quickly surrounded the Japanese and he was being roughly handled when he managed to elude his assailants and escape. Watertown residents can get ready and prepare for the inevitable — the day when the city buses will no longer be operating is nearing here, according to reliable reports. Although no formal announcement has yet been made regarding this, Watertown will be joining the list of cities in which the bus lines are vanishing. Fort Atkinson, Port Washington and Beaver Dam have already joined the list of municipalities where the bus lines have “folded” and the list is growing. Not enough revenue and lack of general patronage and ever increasing operating costs are the reasons for this growing problem. Bob and Anne Krystyniak, who have led Watertown Ace Hardware to spectacular growth over their 18 years of ownership, have sold the business to a father and son team which operates hardware stores in the Milwaukee area. Jim Blair and his father, Robert, became the new owners of the business today. Employees were told of the impending change in meetings over the weekend. The Blairs operate hardware stores in Menomonee Falls and New Berlin and also have a commercial/ industrial division called Induserve Supply which will also be available in Watertown. The officers of the Bank of Watertown today announced that they had acquired the property at 106 Madison Street, formerly occupied by Pike Egg & Feed Company. This property will be made available for parking to Bank of Watertown customers while transacting business at the bank. It will be ready for use soon. The property at number 8 Main Street, occupied by the New York Market, was purchased by the bank some time ago and number 10 Main Street was acquired some years ago. In the early part of the 20th century, the building at 106 East Madison Street had been occupied by Ernst W. Hoeffner as a boarding house and saloon. In the 1940's, it was known as 'Heinie's Tavern'. In the 1950's, the large plate glass windows beneath a crank out canvas awning had 'Pike's Egg & Feed - Eggs & Farm Supplies' signage. 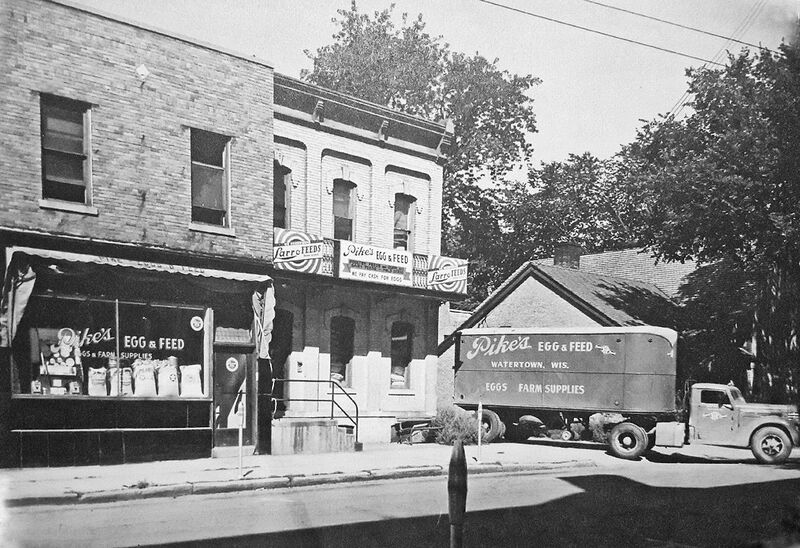 By 1960, the two old buildings that comprised the feed store were sold and to make way for a parking lot of a new nearby bank building. Six years later, the parking lot was sold and a Masonic Temple was built and dedicated in 1967. In 2001, the building was purchased and is now occupied by the Watertown Community Church. Firemen have a longstanding reputation for rescuing cats out of trees. But a duck from a river? Watertown firemen responded at 7:40 a.m. Monday to Riverside Park on a call that a duck was tangled in some kite string in the Rock River. The excess string was from a stray kite which somehow had found its way into a tree along the riverbank. Sometime during the night, the unfortunate duck apparently trolled into the string causing itself to be tangled and immobile. Firemen used a pike pole to pull the string with the duck into shore and released the bird. It was not treated and transported to Watertown Memorial Hospital. The sound of train horns in Watertown is likely to return under a proposed federal rule that will pre-empt a local ordinance banning the whistles. The proposed rule, scheduled to take effect in January 2001, says that train horns are to be sounded at public highway-rail grade crossings unless they are located in a quiet zone and equipped with safety equipment approved by the Federal Railroad Administration (FRA). In 1995, Watertown implemented a 24-hours-a-day ban on train horns in response to some residents near the crossings who said the horns were a disruption. The city is at least one of 27 state municipalities which have whistle bans at crossings except in the event of an emergency. Three more years. Voters gave Fred Smith a third and final term as Watertown’s mayor Tuesday over challenger Ken Berg. Smith, who captured all nine aldermanic districts in the city, received 3,072 votes, nearly 60 percent of the ballots cast, in his re-election bid. Berg, a two-term alderman representing the 3rd District, received 2,088 votes. Watertown now has a chapter of the Disabled American Veterans, it was announced today following a preliminary meeting held at the National Guard Armory. State Commander Harold F. Wellnitz and John Richling Jr., national service officer, were present at the meeting to outline the purposes and aims of the organization. The charter is being held open for 45 days from the date of organization for those who wish to appear as charter members. Interested persons are asked to contact any member or Leslie Schmutzler, local commander. JUNEAU—Air Watertown’s offer to operate the Dodge County Airport free of charge is getting serious consideration and undergoes closer scrutiny at 11 a.m. Friday when the Dodge County Highway Committee meets with the firm’s owners, Jeff Baum and Pete Schoeninger. The pair, in speaking with County Board Chairman H. J. Kreutzmann and Highway Commissioner Robert Henken, said they could have someone at the airport within a day. The airport at present has no operator. Pilots can land and take off at their own risk and Chuck Swain of Beaver Aviation is pumping gas as a service. More than a century and a half of worship in the German language at St. Mark's Evangelical Lutheran Church will continue this month with the annual Good Friday German service. The service will begin at 10 a.m. The sermon will urge worshippers "Lasst Uns Heute Christum Am Kreuze Ansehen" ("Today, Let Us Consider Christ on the Cross"). John 19:17-24 will serve as sermon text. German liturgy and German hymns will accompany the day's worship. The Rev. Karl Walther will officiate. Mr. S. M. Hewlett’s address before the Dashaways last Monday evening was able and interesting. He presented an old theme in a new and attractive light, and from beginning to end, held the attention of the large and intelligent audience which assembled to listen to his first effort in this city. Hon. L. A. Cole presided with his usual dignity and urbanity. Everything was admirable—the speaking, the music, the lightning that blazed along the clouds, and all went home gratified and pleased. The probability is that the young and vigorous order of the Dashaways will make tangle-foot whiskey, aloes and strychnine—the latter should be reserved for vagrant dogs—in less demand as a drink hereabouts. May the vile stuff and its kindred poisons be speedily dashed from all lips . . . On motion that there be an amendment to the pledge so that it may read, “To abstain from drinking any kind of intoxicating liquors, wines, ale, beer and cider.” After some discussion it was finally passed. The Dashaways—This association, although yet in its infancy, has been instrumental in accomplishing much good in our community. Its numbers have increased from week to week, until at the last regular meeting the number enrolled was fifty-three. The association was first organized under the name of the Anti-Tanglefoot Society, under the management of our esteemed citizen, General James Potter, Jr., to whose efforts, together with the cooperation of his friends, we are now indebted for this useful and efficient temperance organization. In the early stage of its operation, it was deemed expedient not to include among the discarded drinks the comparatively harmless beverage of Lager Beer; but after battling successfully with the more villainous fluids, like Alexander the Great, this army sighed for more enemies to conquer, so by a vote of a majority of its members, they pitched into Lager Beer, Esq., and turned the hitherto respectable gentleman out of the society, and to keep him away changed the name of the institution to the Dashaways, leaving Lager Beer—a former member of good standing—without the pass-word. Aside from the main object of the organization, by way of variety and interest, a literary department has been added, which consists of a short essay, to be delivered by some member at every meeting—essayist to be appointed by the President; subject of the essay optional with the writer. Last Saturday the audience was entertained with an address from Myron W. Reed, Esq., subject, “Tanglefoot-whiskey and its accessories.” The President appointed as essayist for the next meeting, Ashley Harger, Esq., who will discourse upon the beauties of grog generally. They public is invited to attend. 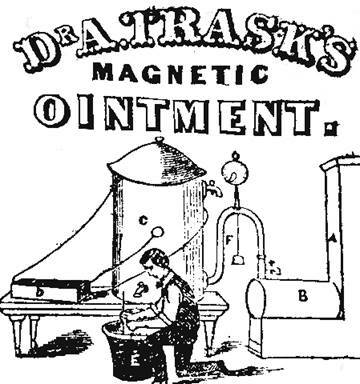 Dr. A. Trask’s Magnetic Ointment—Try this remarkable and most interesting remedy. It is composed of the concentrated juices of the most powerful and most soothing plants and roots in nature, chemically combined and insulated in well-sealed glass bottles and charged by a powerful battery, this possessing in addition to its superior medical virtues, strong magnetic and electric properties, profoundly penetrating and eminently quieting and soothing. It relieves pain and inflammation at once . . . If applied in season it is an unfailing remedy for the croup, sore throat, inflammation of the lungs, bowels, liver, kidneys and other organs, rheumatism, spinal irritation, ague in the breast, and at times cures nervous headache, sore eyes, ear ache, tooth ache, pimples and eruptions of all kinds, piles, bruised and sprained limbs, burns . . . it will also restore hair to the bald head. Has been used upon canal and draught horses and sheep. For sale by all druggists. An Editor is often called upon to edit articles that he knows will cause sorrow in many hearts; for instance, some railroad or steamboat disaster is to be announced, a fatal accident is to be recorded; then is his heart sad as he thinks of the tears that will be shed as the paragraph he is editing will be perused. But when he gets an item that will send joy to every heart, the pen glides briskly over the paper. These are our feelings as we write “Kennedy’s Medical Discovery”— it is life to the dead and health to those who are sick. All is cured through its magic influence, from the slightest pimple to the severest case of scrofula [a form of tuberculosis]. Its price is reasonable, it can be obtained everywhere and there is no occasion for the afflicted to remain so. Last Friday John Enwright, residing in the town of Milford, while working in a field of rye, was bit on the fore finger of the right hand by a rattle snake. When he first discovered the reptile it was gliding away from him. He seized a rake and tried to strike it, but failing in this, and seeing the snake run to a hole, he caught it by the tail and dragged it out, when it struck him. This occurred about noon. He immediately began to drink whiskey, started for this city, and called at Edward Johnson’s Drug Store for medical aid. The hand and wrist commenced swelling and became painful. Near half past 1 o’clock Dr. James Cody examined the wound. As the successful treatment of a case of this kind may be generally interesting, we will give a full account of the course pursued. When Dr. Cody first saw it, the swelling was rapidly extending into the arm. The poison was in active operation. He mixed four grains of iodine of potassium and twelve drops of tincture of iodine in a glass of brandy and gave a dose to the patient. He made several punctures into the cellular tissues on the back of the hand, which were well injected with tincture of iodine. Tincture of iodine was also constantly applied to the inflamed finger and hand, and made to follow the inflammation in its course up the arm. Cooling lotions were steadily applied. After two hours tincture of iodine and brandy were again given, but common whiskey was the principle drink, and taken so often as to keep up a constant state of intoxication, which last effect was not allowed to abate for a moment. In twenty-eight hours after this treatment commenced, the inflammation extended to the shoulder, but did not pass beyond it. In twenty-six hours the swelling began to go down, and no mortification appearing, it was thought safe to allow the patient to go home, his recovery being regarded as certain. At last accounts he was doing well. That probably will be the last rattle snake he will attempt to catch with his hands. The astonishing virulence of its poison began instantly to show itself, and the escape from its fatal effects was hardly less narrow than fortunate. There are but few of the venomous and dangerous creatures in this part of the state, and they are being killed off fast. The Fourth of July was generally observed in this city. In fact, the celebration was the best we have ever witnessed. The addresses of Messrs. Lindeman and Hewlett were appropriate and eloquent, and Mr. Shorey read the Declaration of Independence with a spirit and force that threw meaning in those words of truth, hope and freedom. The little girls who personated Liberty, Union, the Constitution and the States were a brilliant and pleasing feature in the long and crowded procession. Lincoln’s name appears to be rapidly sinking into obscurity from which it so unexpectedly rose. The Republican papers place no hopes upon his popularity. They have fixed their attention solely upon the Breckenridge movement, which they are attempting to swell into consequence. Unanimous Call—The members and congregation of the Congregational Society held a meeting last week and by a unanimous vote gave the Rev. Charles Boynton a warm and urgent call to become the pastor of that church. Mr. Boynton has labored here for several months with a zeal and usefulness that renders his continued services very desirable. He has early secured a place in the confidence and affections of the people of his charge that promise the happiest results. The ceremonies of his installation will probably take place in a short time. Incendiarism—Sometime during the night of the 13th inst. the slaughter house of J. H. & J. Martin, situated near the Rough and Ready mills, was consumed by fire, together with all the implements belonging to it. As there had been no fire or light used near it during the day, there seems to be no other conclusion but it was purposely set on fire. A live lamb was tied fast in the inside of the building, which the incendiary, whoever he was, had the humanity to loosen and let go, before committing his act of revenge or malice. It is to be hoped that the perpetrator of this rascality will be discovered, and made to suffer the full penalty of the law for this outrage. Fifty dollars reward has been offered to any one who will disclose the name of the guilty party, or give information that will lead to the detection and conviction. Last Sunday evening, between ten and eleven o’clock, the Brewery near the Railroad Hotel belonging to William Anson, was found to be wrapped in flames. A heavy shower was pouring down, and flashes of lightening have seldom been more brilliant or more frequent in this region. The building and its contents was entirely destroyed. The loss is estimated at something like $1200. It was insured for $1000. The fire has been attributed to lightening. Local family physician Dr. Michael Grajewski has started an independent practice in the former Medical Associates Family Medical . Grajewski is a member of the Watertown Memorial Hospital medical staff and is board certified in family practice. His practice also includes obstetrics. Two physician assistants who were with the Medical Associates physician group will continue their employment with Grajewski. Jolene Huber, P.A.C., and Gene Ott, P.A.-C., will assist Grajewski in diagnosing and treating patients. A Good Time. The Milwaukee Light Guard celebrated their Fifth Anniversary last Monday by a Picnic Excursion to Oconomowoc. According to the newspaper accounts, they must have had an agreeable time. They were accompanied by a large number of the citizens of Milwaukee. The Rev. Orlo Espeland, pastor of Immanuel Evangelical Lutheran Church, has accepted an appointment with the American Lutheran Church National Office in Minneapolis, Minn. After serving for eight years at Immanuel, Espeland will be leaving in early June. Before coming to Watertown he served in Holman. While serving at Immanuel, Espeland has overseen the installation of the pipe organ, an expanded staff, the new parish education building has been completed and a radio broadcast of Sunday service over WTTN has started. He has also helped to start a special education class for the handicapped members of the congregation. The recent announcement by the Police Department that it was beginning to enforce the bicycle code has resulted in the first court appearances under the act. Seven boys appeared before Judge George E. Niemann here Saturday. Two were charged with riding double, three were cited for arterial violations and two were charged with having no headlights on their vehicles. All boys were sentenced to attend Traffic School, which will be conducted by members of the VFW Post on June 21 at 9:30 a.m. at the Recreation Building. Tests will be given to all the boys. Those who do not pass will be required to attend another Traffic School session. The Chicago and Northwestern Railroad Company is about to put on their track one hundred and fifty more freight cars, to accommodate the increasing business of that line. This addition to the already great facilities for transportation will be needed. No one can doubt that the carrying trade this fall will be enormous. The golden burden of our broad and fertile fields must find its way to market over our railroads, and it is well for their managers to be prepared to do the business that will soon be ready for them. L. J. Kadish has just started in this city an extensive lumber yard near the depot of the Chicago and Northwestern Railroad. All qualities of pine lumber will be kept constantly on hand. The supply comes directly from the heavy mills of the north where are manufactured those immense quantities demanded by the whole country. The Chicago and Northwestern Railroad is now protected by a permanent and substantial fence along its entire length from Chicago to Oshkosh. We believe no other company in the state has yet completed such a work as this. Though the track is in excellent condition, parties of men are engaged on the newer portions of the line in ballasting and gravelling such places as may need a little fixing to make them more even and durable. The trains are run at such hours as will best suit public convenience, and the affairs of the road are under excellent and prudent management. The business of the road has been large during the whole season, and the rich and fertile country which it penetrates promises to furnish a much greater amount of travel and transportation this fall. It passes through the length of the state, and for miles and miles a broad expansion or succession of fields of grain stretch out on either side of it. The evidences of prosperity and increasing wealth which meet the eyes of the rapidly passing traveler as he goes over it, excite the admiration of all who witness them. So a person cannot be so sure in regard to anything, but that his faith may be a little staggered at times. How is it that the Vulcan Iron Works have run constantly, for the last three years, without the smiles and approbation of “Old Vulcan” is a little mysterious. We are not so sure. We would not state positively, in fact, we are half inclined to believe, that in this instance, an exception to a general rule might be introduced, and not deny the fact, although unwilling to admit it, that he has in all his august majesty presided over that institution and kept the wheels in motion. The present proprietors are Otis Hall & Co., and all the work is done under the immediate supervision of Otis Hall, who is a practical mechanic of long experience. And here we wish to say to those whom necessity compels to have work done in their line, they are thoroughly prepared to execute orders in the very best manner possible, having all the necessary tools and machinery for that purpose. They are just now finishing up some of the best Threshing Machines we ever saw—and we consider our self a judge—machines that may have equals, but not superiors in this country. Trucks, Straw-Stackers, etc., are complete. And we deem it of the most decided advantage to farmers living in this vicinity to purchase these machines in preference to those made in other localities. By so doing, they save a large amount of time and money, in being able to get their machines repaired near home, where they keep constantly on hand a large supply of materials for that purpose and hold themselves in readiness at all times—night and day—to accommodate those who patronize them. We are satisfied that with the facilities, energy and skill of the proprietors, together with the aid of “Old Vulcan,” (although we would not have it understood that we invoke his aid, but we would not openly object) this establishment must prosper. John Hane of Farmington brought into this city last Tuesday morning the first load of winter wheat that has been offered for sale this season. It was purchased by Henry Bergmann for V. D. Green & Co. of the Red Mills, and before this time is probably manufactured into flour. The quantity was 20 bushels, the price $106, and the quality unsurpassed. If this lot is a fair specimen of the grain of this state, Wisconsin bread stuffs will stand first among the very best, for better wheat cannot be grown on any soil. We ask our friends Green & Co. to remember the order we gave them a day or two ago and send us a “sack” from this first purchase, not for this notice, but because it will make us square on subscription, with this slight allusion thrown into the bargain. We observe that Enos Salsich is pushing forward his addition to this establishment and will soon add a larger area in which to continue the enterprises he is constantly engaged in. He is a go-a-head man and will come out right yet. New Ice Cream. George Gilman has recently opened in Ice Cream Saloon and Fruit Store on Main Street. Parties can get there every evening a glass of delicious ice cream with “fixins,” and the choicest varieties of fruits. Fine cigars can always be had there. Give George a call and see how generously he will serve you. Watertown now owns a softball diamond tarpaulin. Thanks to the local Junior Chamber of Commerce, the city park commission was formally presented with the gift Wednesday afternoon at Riverside Park. Sports fans who frequent Riverside Park for softball tournaments and other important events will appreciate the gift. Many times they witnessed tournament games which had to be called because of a downpour. Now with the new “tarp” the ground will be completely protected against rain. Span of Cream Colored Colts . . .
Taken Up—On the 21st inst., in the town of Waterloo, Jefferson County, three miles south of the village of Waterloo, one span of cream colored colts, one four and the other five years old, one a mare and the other a gelding, with a light mane. The owner can have them by calling on the subscriber and paying all charges. John Hazen. Notice to Contractors. Sealed bids will be received by the undersigned, at the office of the Clerk of the Board of Supervisors of Jefferson County, in the village of Jefferson, in said county, for the construction of an addition to and for repairing the Court House, as set forth in specifications, for said addition and repairs to be seen in the office of the Clerk of the Board of Supervisors, and in the possession of the chairman of the Board of each town, and the wards of the city of Watertown. – Wm. P. Forsyth, A. H. Waldo, J. D. Waterbury, Building Com. Came into the premises of the subscriber on the 25th of May last, in the town of Emmet, Dodge County, a Red Cow about ten or twelve years old, with high horns. The owner is requested to prove property, pay charges, and take the same away. C. M. Kees. The Dodge Co. Citizen says that a young man named William Long has been writing sundry little notes and appending the signatures of different men—mostly farmers in the county—and that he traded them off for cash or what he could get. When afraid to trust his own writing he got little girls to write names under his direction, keeping them ignorant of his object. Of the extent of his forgeries we have not been informed, but when the game was up, he suddenly departed. Anno Domini 1860, according to entomologists, is locust year. The red-eyed cicada has proved itself in its visits to New York State, so much like the genuine oriental ravager that has always gone by the name of locust. A peculiarity of its natural history is that the usual length of time which it requires for completing its growth and the perfect regularity with which every generation, numbering many millions of individuals, attains maturity, cause the infliction of its presence unfailing at the end of very seventeen years. The last appearance of this greedy insectship, it is said, was in 1843; so, if there is any faith to be put in croaking entomological prophets, we are in for it again in this year of grace. There is no great cause of alarm, however, for the depredations of the marauder are usually confined to the forest; he is hardly ever found on lands that have duly yielded harvests during the seventeen years of his absence. So that in the steady onward march of civilization, it seems even the seventeen years locust must fall into line and there is room for hope that in time he will cease his ill-mannered invasions altogether.